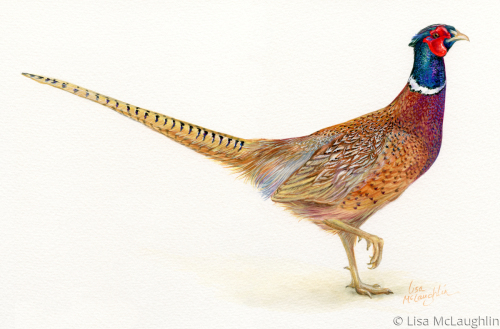 Lively and colorful, original watercolor movement study of a male pheasant strutting about. The original painting has been sold. 5" x 7.5"9" x 13.75"13" x 19.75"17" x 25.75"21" x 31.75"23" x 35"
Lots of energy and personality. This osprey means business! 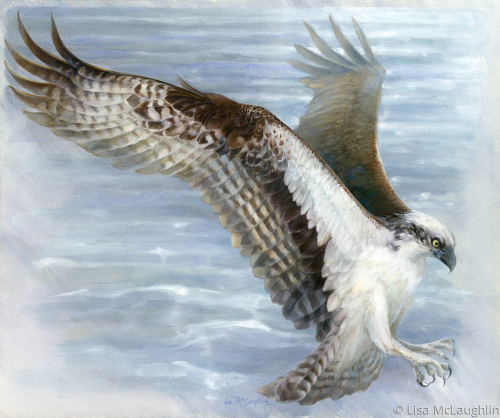 Original watercolor painting of an osprey in that moment just before the strike. Very intensely focused. Loads of detail in wing feathers. 5" x 6"10" x 12"15" x 18"20" x 24"25" x 30"29.25" x 35"
Golden Eagle perched, piercing eyes, intense focus. Life-sized original watercolor painting required over 100 hours to complete, has been sold. captures the rich color and beauty of the original watercolor painting. Hand-signed and numbered by the artist. 11” x 14” unframed. Ships flat in a sturdy custom designed box to insure safe arrival. Display easel not included. Free shipping within the US. 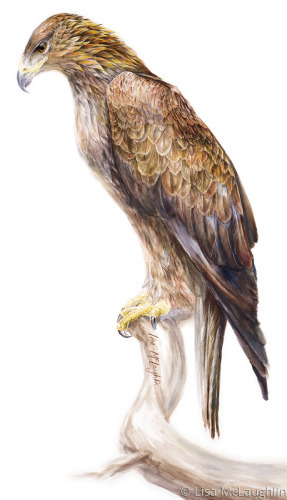 Golden Eagle print, limited run of 1,200. You may request a specific number in the series, if available. Rufous Hummingbird hovers over bright red wildflowers. 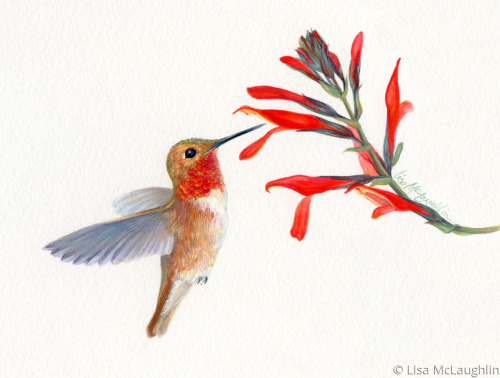 Original watercolor painting from wildlife artist Lisa McLaughlin capturing the personality of this vivacious, fearless little bird, is available for purchase, please contact. 5" x 6.5"9" x 12"
Watercolor in muted tones of silver, grey, aqua. 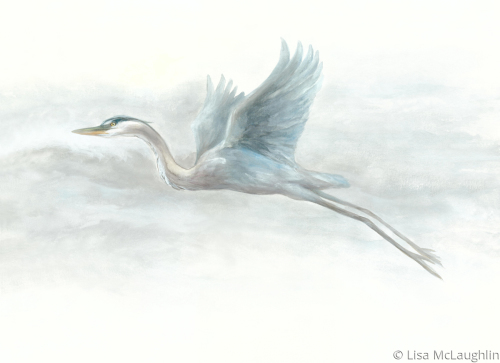 A Great Blue Heron flies peacefully on a misty morning. Professionally custom framed. 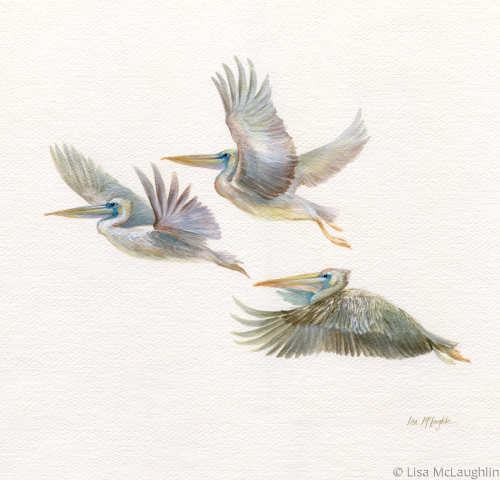 Beautiful watercolor study of three pelicans flying together. Peaceful. Simple. A Lisa McLaughlin original painting. 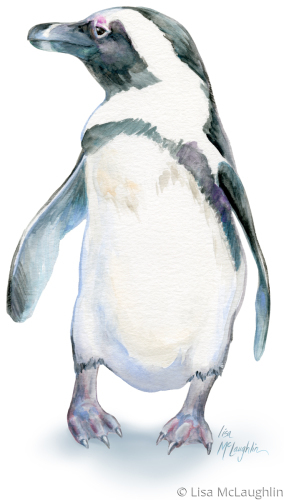 5" x 5.25"11" x 11.5"17" x 17.75"23" x 24"
Watercolor study of a penguin. Loads of personality. A Lisa McLaughlin original painting. The unframed original is available for purchase. Please contact. 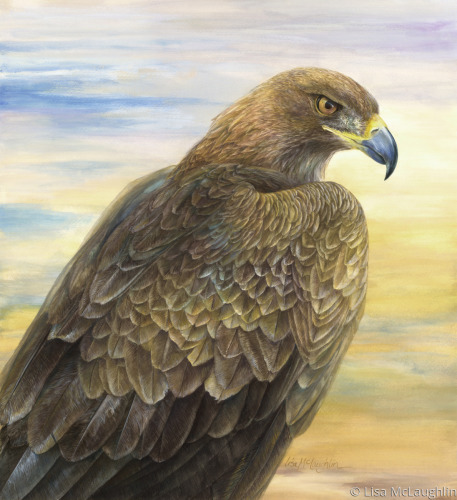 8.75" x 5"14" x 8"19.5" x 11"24.75" x 14"30" x 17"35" x 19.75"
Proud, majestic, Golden Eagle looks out over the desert sky. Sunset, warm gold hues. Exceptional detail in the feathers. Highly detailed original McLaughlin watercolor painting is available for purchase, please contact. 5.5" x 5"11" x 10"16.5" x 15"22" x 20"27.25" x 25"35" x 32"
Lots of action. 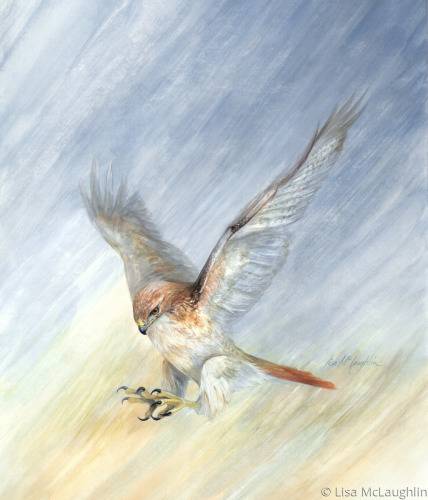 Red-tail hawk meticulously strikes. Intensity, grace. Notice the accuracy in the depiction of the talons. 5.75" x 5"11.75" x 10"17.5" x 15"23.25" x 20"29.25" x 25"35" x 30"